See Israelinurse’s take down of the Guardian’s latest contributing travel writer, and anti-Israel activist, Sarah Irving, for a complete picture of “10 highlights of Palestine“, Nov. 18th, but the following passage from Irving’s travel log deserves a bit more infamy. Granted, tourism to Palestine still faces many challenges, not least the Israeli border authorities who control all routes into the West Bank and Gaza. Ooops! It seems like our former International Solidarity Activist volunteer forgot one quite large country. It’s not nice to laugh at the afflicted. That comment provoked a big titter from me, which must make me not very nice at all. 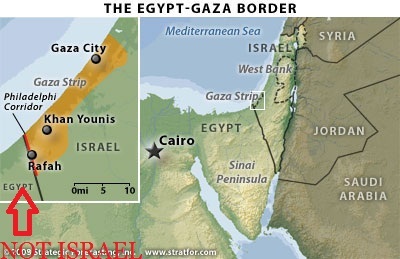 to “yet anuvver,” not even the Egyptian govt controls what goes into Gaza through Rafiah. With lower ranks in the Egyptian police and army willing to take bribes, especially for what they may consider a good cause [i.e., Hamas], the Egyptian central govt cannot be sure of what is going on on the borders. Further, Egypt does not take orders from Israel [I only wish], not now and not in Mubarak’s time. On the other hand, Egypt’s govt had an interest in keeping any heavy weapons out of the Gaza, out of Hamas’ hands, since Hamas was and is an ally of the Egyptian Muslim Brotherhood which was an enemy of Mubarak’s govt –and an enemy human rights, especially those of the the native Egyptian Christians, the Copts. Another thing: including the Arabic name for the Dome of the Rock (“Qubbat as-Sakhra”) is fair enough – but why not also include the Hebrew transliteration “Kipat Hasela”? Her guide reminds me of a pre-1989 East German map I still have of Berlin and environs. West Berlin is simply shaded grey, with no streets at all. And again the brainless idiots vote down a comment that is actually supporting the article – with none of the cowardly masses able to actually express themselves in word. A bunch of freaking idiots indeed. It’s called cutting off your nose to spite your face: G-d forbid they ever became a majority in Israel. Sarah Irving and all those at the Guardian: ‘little, shrivelled, meagre, hopping, though loud and troublesome, insects of the hour’. The Left’s New Vision. By the wonderful Anonmoos. What proportion of people on the left do you think actually want anything resembling the scenario painted in that link? And how on earth is that silly map an “elaboration” of what I said? The only thing wrong with the map. pretzel, is that Hamas and Fatah would never be so equable. Good point (assuming you mean “equitable”)! But I still don’t get what that map has to do with my point above – and “The Left”. What AnonMoos envisioned was “no Israel”. Your cartographer pictured a grey desert, AnonMoos knows who would cause Israel not to be there. Whatever number or proportion of people on the Left approve of and support Israel’s enemies is too many or too much. But AnonMoos’ map is something different. And they’re a complete idiot if they think that’s “the left’s” vision. Actually they probably don’t think that. They just use it to bash left-wingers (the overwhelming majority of whom, of course, have nothing against the existence of Israel). AnonMoos is far from any kind of idiot. His visual work on the ME is stored on CrethiPlethi’s site these days. He can read ancient Arabic scripts. Where do the anti-Israel and antisemitic hordes – and I use that word more pejoratively than numerically – in The Guardian come from? Not moderate Conservatism, surely. And not the moderate/majority left, either. pretzelberg, explain the European anti-Israel funding of NGOs within Israel. Which “anti-Israel funding of NGOs” are you talking about? 6 no-votes just for asking a question! What a bunch of monkeys you are. http://www.ngo-monitor.org/“>Sorry! Too short of time. You can’t even type the names of a few organisations? And instead link to a propaganda website? Oh dear. I can only assume you are unable to back up your “anti-Israel” jibe. Sadly typical for this website. pretzels, How’s this for an “anti-Israel” jibe? Please note the tens of thousands of adoring fans of the little fascist President of the Islamic Republic. DEATH to the Islamic Republic of Iran. But the one who has done the above and more is someone near and dear in ideology to you. I made one error through haste and then another. I respect learning and appreciate research and do not categorise the products of these as propaganda. And I am very happy to let those who’ve done the work speak for me.